As a pioneer in the field of spirituality and ecology, Thomas Berry created a quiet revolution. He was a monk, a cultural historian, an author, a teacher, and a mystic. He saw his life work as waking us up to that sacred story. 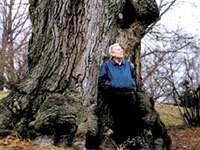 He called us "mad" for the way we are despoiling our home, our planet, its beauty, and its living systems. He was a force that reminded us that we are living through the greatest extinction spasm of the past 65 million years. We are the ones responsible. Berry urged us to change our ways. At the heart of the film is Berry's experience of the universe as a cosmic liturgy. He reminds us that "we are not a collection of objects but a communion of subjects." His values were rooted in this sacred cosmology which includes the entire natural world. The mountains, rivers, birds, fish, all living organisms are not there for our use but for a union which is needed for us to become who we are. As Berry said, "I am not myself without everything else." "Tom gave us the picture--it's a picture of the earth as the center of everything...of our consciousness, of our physical being, of our world. As a theological person, that really turned my whole thinking upside down." "We are grateful to Thomas Berry and to the makers of this marvelous film who have captured some of his spirit and his deep message so important for our times." "Thomas Berry's vision is our best guide to a prosperous future and THOMAS BERRY: THE GREAT STORY is the most comprehensive film presentation of his thought." "Thomas Berry puts forth the grandest story ever told...Beyond all my experiences with universities, literature, and wisdom traditions, Thomas Berry's work has opened the door for me to the most thrilling, over-arching, inclusivist, all-embracing and empowering perspective I have ever encountered. Thomas may well be the most important guide we have, for the future of humanity in concert with the community of life on Earth." "Berry's life work eloquently communicates the immanence of the Sacred in the world. He considered that our species is at a crucial evolutionary moment of transition. We need a new spiritual vision to carry us forward from the end of the Cenozoic geological era, for our future to be possible." The DVD contains 47 minutes of additional interviews with Thomas Berry on The Great Work (History, Reinventing the Human, The Corporation), Universe (Spirit/Matter, Linear Time vs. Seasonal Time, Existence), and Art (Poems, Creative Disequilibrium), plus scene selection.